Who is this colorful character? 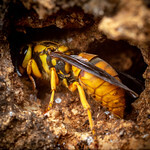 The cumulative points winner for the month of February will win their choice of 1) any 8×10-sized print from my photo galleries, or 2) a guest post here on Myrmecos. Well I’m going to throw in for Sesiidae as the current family, although I’m not sure what the former family or the genus are! Well, from hours of painful, painful moth IDing for iridescence stuff plus the fact that the family has recently (?) changed, I’m guessing it’s a member of Arctiidae, formerly placed in Ctenuchidae. Somebody’s gotta be working on that group (I hope?). They have the most amazing structural colours and other visual signals, so much better than some loser butterfly. Is it Erebidae, Cosmosoma? It used to be that Arctiinae was a full family before being included in Erebidae. When I used to volunteer in my local museum’s IZ department, I was given the task of sorting moths (I think from Ecuador) very similar to this. Gosh, that was painful, looking at the patterns of each moth and trying to decide whether it was the real deal or from another part of the (extensive, am I right?) mimicry complex. Beautiful moth! I probably missed out on the points… but I can’t resist chiming in on a moth image. The current family is Erebidae as mentioned above. It should be pointed out that Sesiidae and Ctenuchidae(inae) have never been considered once in the same – actually they are pretty far apart family wise! The semi-recent historical breakdown of family placement has been Ctenuchidae to Arctiidae to Erebidae now. The guess of Loxophlebia is a good one, but I’m not familiar with western Ecuadorian moths. 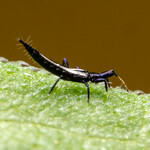 The other genera that are close and haven’t been mentioned: Mesothen nomia or maybe Gymnelia bricenoi when you consider banding patterns… but they are from the eastern slope and look to be superficially smaller. Drat – easy points I could’ve scarfed up if only I’d gotten here in time (considering the post I did this morning). Gorgeous image of a gorgeous wasp, er… moth! A moth? Why not just put a bird up? But seriously, I have no idea, no free pics for me, boo. Also too late for this one, but following current family (Erebidae), previous family (Arctiidae) and genus (Loxophlebia), I’ll have a go at species – L. nomia (i.e. agreeing with Ben Coulter). Arrrgghhh I need to like, set an alarm for these posts.